Common bermudagrass (Cynodon dactylon [L.] Pers.) is a warm-season perennial turfgrass commonly grown in Louisiana. It has a high tolerance for traffic, heat and drought. Vegetatively propagated cultivars are more desirable because of their dense, compact growth habit. They are commonly used on athletic fields and golf courses. These cultivars are also sterile and will not spread from seed. 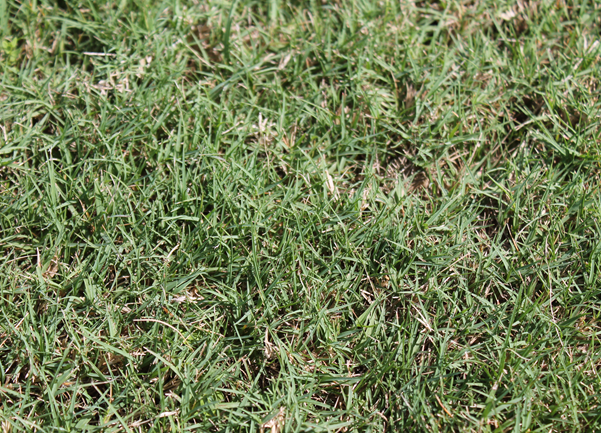 Common bermudagrass is often considered a weed as it is not sterile and can spread through seed. Bermudagrass is a fine-to-medium-textured turfgrass with light green leaves that sometimes have a silvery appearance. However, some cultivars are darker green in color. Leaves are narrow and sharply pointed at the tip. Flower stems usually have three to seven spikes (stems of clustered flowers) with tiny, pink-to-purple flowers. Bermudagrass produces robust stolons (aboveground stems) and rhizomes (underground stems), both of which allow it to spread laterally. It has a tight, dense, compact growth habit. Soil Type: Grows in a range of soil types and can tolerate drier soil conditions compared to many other turfgrass species. Soil pH: Prefers slightly acidic (< pH 7) soils, but optimal pH is between 6 and 7. Always follow soil test recommendations to achieve desired soil pH. Light: Prefers full-sun areas and does not grown well in partially shaded to heavily shaded areas. Growth Rate: Spreads quickly via stolons and rhizomes. Mowing and Traffic: Mow at 1 to 2 inches routinely during the growing season. Never remove more than one-third of the leaf blade height at one mowing. Mowing at the appropriate height is key in preventing scalping and reducing weed encroachment. Bermudagrass has exceptional traffic and wear tolerance. Fertilization: Fertilize with up to 3 pounds of nitrogen per 1,000 square feet per year. Fertilizer should be applied from midspring to midsummer. Never apply more than 1 pound of nitrogen per 1,000 square feet per application. Nitrogen will result in faster bermudagrass growth so applying lower nitrogen rates may be advisable. Follow soil test recommendations for proper fertility. Dethatching and Aeration: Thatch can develop over time and may need to be reduced through vertical mowing. Compaction can form more quickly on finer-textured soils and in areas where there is high traffic. Dethatching or aeration need to be performed in late spring to summer. Establishing bermudagrass in the lawn can be achieved via seeds, plugs or sod. Bermudagrass is most commonly established via seed for common bermudagrass and plugs or sod for vegetatively propagated bermudagrass cultivars. Seed: Select and purchase your desired seed. Follow the manufacturer’s labeled directions for seeding rate. Rake seeds into the soil surface to ensure good soil-to-seed contact. Irrigate until seeds germinate and as needed throughout establishment. Hybrid bermudagrasses cannot be seeded. Sprigs: Sprigging is an involved method in which vegetative pieces are planted to establish an area. Plugs: Purchase plugs or create plugs from sod and plant each piece about 1 foot apart. Irrigate, fertilize and apply weed control as necessary until established. Sod: Purchase sod and lay it on a smooth soil surface. Irrigate frequently after laying sod and continue to irrigate as needed until sod roots are established.